Brazilian migration to the United States—a relatively small flow until recent decades—began to grow significantly in the early 1980s, driven in large part by a series of economic crises in Brazil. The Brazilian immigrant population in the United States doubled during the 1980s, almost tripled in the 1990s, and then stabilized following the Great Recession of 2007-09 (see Figure 1). In 2014, 336,000 Brazilian immigrants lived in the United States, representing 1 percent of the 42.4 million immigrants in the country. Approximately one-fifth to one-third of them are in the United States without authorization, according to Migration Policy Institute (MPI) estimates. Economic and social conditions in Brazil, together with changes in U.S. immigration policy, have shaped the nature and scope of the Brazilian flow to the United States. During the 1980s, most Brazilian immigrants entered the United States on tourist visas, and some overstayed their visas to work for a couple years before returning to Brazil. Once personal finances and savings from the initial trip were depleted, some Brazilians returned to the United States to again take up work—a pattern known as "yo-yo” migration. However, in the late 1990s U.S. policymakers tightened tourist visa requirements for Brazilian nationals. More broadly, the Illegal Immigration Reform and Immigrant Responsibility Act of 1996 also made it much more difficult for any individual who had previously resided in the United States without authorization to re-enter through legal channels. Such changes made cyclical migration patterns between the two countries more complicated. Brazilians who were already in the United States without authorization tended to stay longer, while those seeking to enter increasingly did so by crossing the U.S.-Mexico border illegally. Border apprehensions of Brazilians grew dramatically from 88 apprehensions in fiscal year (FY) 1992 to 32,103 in FY 2005. This increase made Brazilian nationals the fourth most apprehended in FY 2005 (after Mexican, Honduran, and Salvadoran immigrants). However, this flow declined significantly starting in October 2005 when the Mexican government began requiring Brazilians to obtain visas to enter Mexico. The number of Brazilians apprehended at the U.S.-Mexico border plummeted to less than 3,000 in FY 2006 and has remained roughly at the same level since. In the meantime, annual legal immigration from Brazil increased, from less than 5,000 immigrants in FY 1992 to more than 16,000 in FY 2005, before decreasing slightly to 10,000 in FY 2014, with most qualifying as the immediate relatives of U.S. citizens. In recent years, factors including economic recession in the United States, stepped-up U.S. immigration enforcement, and improved economic prospects in Brazil have led a significant number of immigrants to return to Brazil, especially those who are unauthorized and/or employed in low-skilled jobs. Meanwhile, the number of Brazilian international students in the United States has more than tripled, from 7,000 in 2005 to 24,000 in 2015—in part thanks to increased investment by the Brazilian government in international scholarships. Sources: Data from U.S. Census Bureau 2006, 2010, and 2014 American Community Surveys (ACS); and Campbell J. Gibson and Kay Jung, "Historical Census Statistics on the Foreign-Born Population of the United States: 1850-2000" (Working Paper no. 81, U.S. Census Bureau, Washington, DC, February 2006), available online. While the United States is the top destination for Brazilian migrants, less than one-quarter of the 1.5 million Brazilian emigrants live in the United States. Others reside in Japan (182,000), Portugal (130,000), and Italy (104,000), according to mid-2015 estimates by the United Nations Population Division. Click here to view an interactive map showing where migrants from Brazil and other countries have settled worldwide. Most Brazilian immigrants who obtain lawful permanent residence in the United States (also known as receiving a green card) qualify as immediate relatives of U.S. citizens. Compared to the total foreign-born population, Brazilian immigrants are less likely to be Limited English Proficient (LEP), have higher educational attainment and income, and have lower poverty rates. Using data from the U.S. Census Bureau (the most recent 2014 American Community Survey [ACS] as well as pooled 2010-14 ACS data), the Department of Homeland Security Yearbook of Immigration Statistics, and World Bank annual remittance data, this Spotlight provides information on the Brazilian immigrant population in the United States, focusing on its size, geographic distribution, and socioeconomic characteristics. The terms foreign born and immigrant are used interchangeably and refer to those who were born in another country and later emigrated to the United States. Data collection constraints do not permit inclusion of those who gained Brazilian citizenship via naturalization and later moved to the United States. The majority of immigrants from Brazil were concentrated in Florida (20 percent), Massachusetts (18 percent), California (10 percent), and New Jersey (9 percent), according to 2010-14 ACS data. The top four counties with Brazilian immigrants were Middlesex County in Massachusetts, Broward County and Miami-Dade County in Florida, and Fairfield County in Connecticut. Together, these counties host about 22 percent of the Brazilian immigrant population in the United States. Note: Pooled 2010-14 ACS data were used to get statistically valid estimates at the state and metropolitan statistical area levels for smaller-population geographies. Source: Migration Policy Institute (MPI) tabulation of data from U.S. Census Bureau pooled 2010-14 ACS. Click here for an interactive map that shows the geographic distribution of immigrants by state and county. Select Brazil from the dropdown menu to see which states and counties have the highest distributions of Brazilian immigrants. In the 2010-14 period, the U.S. cities with the greatest number of Brazilian immigrants were the New York City, Boston, and Miami metropolitan areas. These three metropolitan areas accounted for about 41 percent of Brazilian immigrants in the United States. Source: MPI tabulation of data from U.S. Census Bureau pooled 2010-14 ACS. Source: MPI tabulation of data from the U.S. Census Bureau pooled 2010-14 ACS. Click here for an interactive map that highlights the metropolitan areas with the highest concentrations of immigrants. Select Brazil from the dropdown menu to see which metropolitan areas have the highest concentrations of Brazilian immigrants. Brazilian immigrants were less likely to be LEP (40 percent) than the overall foreign-born population (50 percent). At the same time, fewer Brazilian immigrants spoke only English at home (10 percent), compared to the 16 percent average for all immigrants. The Brazilian immigrant population was younger than the overall immigrant population, but older than the native born. The median age of Brazilian immigrants was 39 years, compared to 44 for all foreign born and 36 for the native born. In 2014, 89 percent of Brazilian immigrants were of working age (18 to 64), compared to 80 percent of all immigrants and 60 percent of the native-born population (see Table 2). Brazilian immigrants have high levels of educational attainment compared to the overall foreign- and native-born populations. In 2014, 38 percent of Brazilian immigrants (ages 25 and over) had a bachelor’s degree or higher, compared to 29 percent of the total foreign-born population and 30 percent of the U.S.-born population. Brazilian immigrants participate in the labor force at a higher rate than the overall immigrant and native-born populations. In 2014, about 71 percent of Brazilian immigrants (ages 16 and over) were in the civilian labor force, compared to 66 percent of the overall foreign-born population and 62 percent of the native born. Compared to all immigrant workers, Brazilian immigrants were slightly more likely to be employed in management, business, science, and arts occupations (34 percent); service occupations (28 percent); and natural resources, construction, and maintenance occupations (15 percent). Brazilian immigrants had higher incomes compared to both the total foreign- and native-born populations. In 2014, the median household income among Brazilian immigrants was $56,000, compared to $49,000 for all immigrant households and $55,000 for U.S.-born households. Brazilian immigrants were also less likely to be in poverty than the overall immigrant population. In 2014, 13 percent of Brazilian immigrants lived in poverty, compared to 19 percent of foreign-born and 15 percent of native-born individuals. Brazilian immigrants are much less likely to be naturalized U.S. citizens than the overall immigrant population; a fact that has much to do with the back-and-forth migration patterns of this group, as well as its relatively high share of unauthorized individuals. In 2014, 37 percent of the 336,000 Brazilian immigrants residing in the United States were naturalized citizens, compared to 47 percent of all foreign-born individuals. More than half (58 percent) of Brazilian immigrants entered the United States since 2000, compared to 41 percent of all immigrants (see Figure 5). In FY 2014, the majority of the 10,000 Brazilian immigrants who obtained green cards (i.e., became lawful permanent residents [LPRs]) did so either as immediate relatives of U.S. citizens (68 percent) or through employment pathways (23 percent), as shown in Figure 6. Notes: “Family-sponsored” includes adult children and siblings of U.S. citizens as well as spouses and children of green-card holders. “Immediate relatives of U.S. citizens” includes spouses, minor children, and parents of U.S. citizens. “Diversity” refers to the Diversity Visa Lottery program established by the Immigration Act of 1990 to allow entry to immigrants from countries with low rates of immigration to the United States. Brazilian nationals are not eligible for the DV-2016 lottery. Source: MPI tabulation of data from Department of Homeland Security (DHS), 2014 Yearbook of Immigration Statistics (Washington, DC: DHS Office of Immigration Statistics, 2015), available online. According to MPI estimates, approximately 117,000 unauthorized Brazilian immigrants resided in the United States during the 2009-13 period, representing 1 percent of the total 11 million unauthorized immigrants. As of March 31, 2016 (the most recent data available), 7,978 Brazilians had applied for the Deferred Action for Childhood Arrivals (DACA) deportation-relief program, and 7,003 had been approved. Click here for an interactive map showing unauthorized immigrant populations in the United States by origin country and region and top state and county destinations, for 2009-13. Brazilian immigrants in 2014 were uninsured at the same rate as the overall foreign-born population (27 percent). Brazilian immigrants were more likely to have private health insurance than the overall immigrant population, but less likely to have public coverage (see Figure 7). The Brazilian diaspora population in the United States is comprised of approximately 447,000 individuals who were either born in Brazil or reported Brazilian ancestry, according to tabulations from the U.S. Census Bureau pooled 2010-14 ACS. Global remittance flows to Brazil have fluctuated greatly in recent decades. In 2014, total remittances sent to Brazil via formal channels amounted to $2.6 billion, representing about 0.1 percent of Brazilian gross domestic product (GDP), according to World Bank data. Source: MPI tabulations of data from the World Bank Prospects Group, “Annual Remittances Data,” updated April 2016, available online. Visit the MPI Data Hub collection of interactive remittances tools, which track remittances by inflow and outflow, between countries, and over time. Amaral, Ernesto Friedrich and Wilson Fusco. 2005. Shaping Brazil: The Role of International Migration. Migration Information Source, June 1, 2005. Available Online. Bernstein, Nina and Elizabeth Dwoskin. 2007. Brazilians Giving Up Their American Dream. New York Times, December 4, 2007. Available Online. Gaynor, Tim. 2005. Brazilians Using Mexico to Enter U.S. Illegally. Reuters, April 22, 2005. Available Online. Gibson, Campbell and Kay Jung. 2006. Historical Census Statistics on the Foreign-Born Population of the United States: 1850 to 2000. Working Paper No. 81, U.S. Census Bureau, Washington, DC, February 2006. Available Online. Goza, Franklin. 1994. Brazilian Immigration to North America. International Migration Review 28 (1): 136-52. Institute of International Education (IIE). Various years. Open Doors Data—International Students: All Places of Origin. Accessed July 11, 2016. Available Online. Jouët-Pastré, Clémence and Leticia J. Braga, eds. 2008. Becoming Brazuca: Brazilian Immigration to the United States. Cambridge, MA: Harvard University Press. Margolis, Maxine L. 1994. 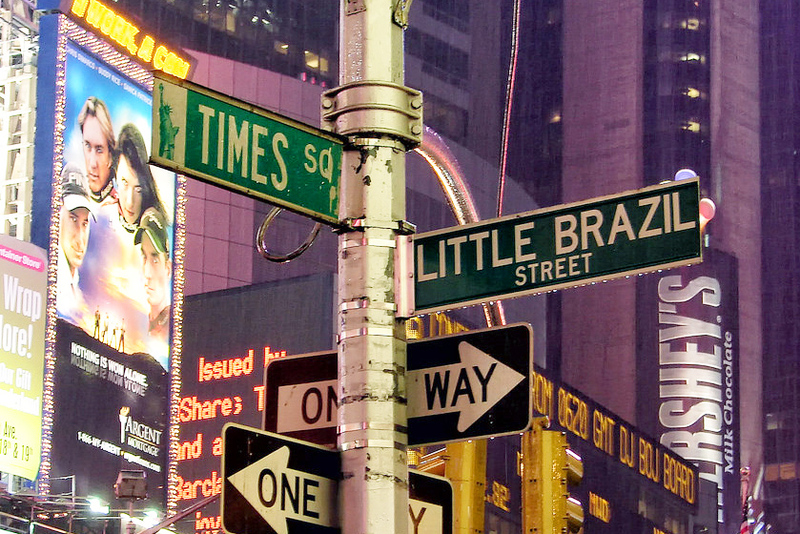 Little Brazil: An Ethnography of Brazilian Immigrants in New York City. Princeton, NJ: Princeton University Press. Skidmore, Thomas E. 2009. Brazil: Five Centuries of Change. Oxford: Oxford University Press. ---. 2016. 2010-14 American Community Survey. Accessed from Steven Ruggles, Katie Genadek, Ronald Goeken, Josiah Grover, and Matthew Sobek. Integrated Public Use Microdata Series: Version 6.0 [Machine-readable database]. Minneapolis: University of Minnesota, 2016. Available Online. U.S. Citizenship and Immigration Services (USCIS). 2016. Number of I-821D, Consideration of Deferred Action for Childhood Arrivals by Fiscal Year, Quarter, Intake, Biometrics and Case Status: 2012-2016 (March 31). Available Online. World Bank Prospects Group. 2016. Annual Remittances Data. Updated April 2016. Available Online.